The Track­er is sub­ject­ed to peer review by the Organ His­tor­i­cal Soci­ety Pub­li­ca­tions Advi­so­ry Board, the Archivist of the Organ His­tor­i­cal Soci­ety, and the Edi­tor Emer­i­tus of The Amer­i­can Guild of Organ­ists. Mem­ber­ship in OHS includes a sub­scrip­tion to The Track­er. Insti­tu­tions may sub­scribe to The Track­er with­out enrolling as a mem­ber at the same rate as Reg­u­lar mem­ber­ship. The past two years of The Track­er are avail­able only to OHS Mem­bers. Please click here to access these issues. The last 2 years of issues are only avail­able to the mem­ber­ship. Down­load a search­able PDF Index of these issues. Year | Vol­ume No. | Issue No. Miss­ing issues will be added as they are scanned. Down­load a search­able PDF Index of Vol­umes 1 – 9. EDITORIAL CORRESPONDENCE may be addressed to the edi­tor at tracker@​organhistoricalsociety.​org. Respon­si­bil­i­ty for facts and opin­ions expressed in arti­cles rests with the authors and not with the Organ His­tor­i­cal Soci­ety. Mate­r­i­al accept­ed for pub­li­ca­tion in The Track­er becomes the prop­er­ty of the Organ His­tor­i­cal Soci­ety, and may not be repro­duced in whole or in part in any form with­out per­mis­sion from the edi­tor. THE OPINIONS expressed in signed arti­cles, reviews, or let­ters are those of the writ­ers and do not nec­es­sar­i­ly rep­re­sent the views of the Organ His­tor­i­cal Soci­ety or the edi­tor of this jour­nal. BACK ISSUES of The Track­er and con­ven­tion hand­books are avail­able from the OHS office. Please call (484) 488-PIPE (7473). ADVERTISEMENTS are paid and do not imply OHS endorse­ment. Adver­tis­ing is not accept­ed for elec­tron­ic sub­sti­tutes for the organ. 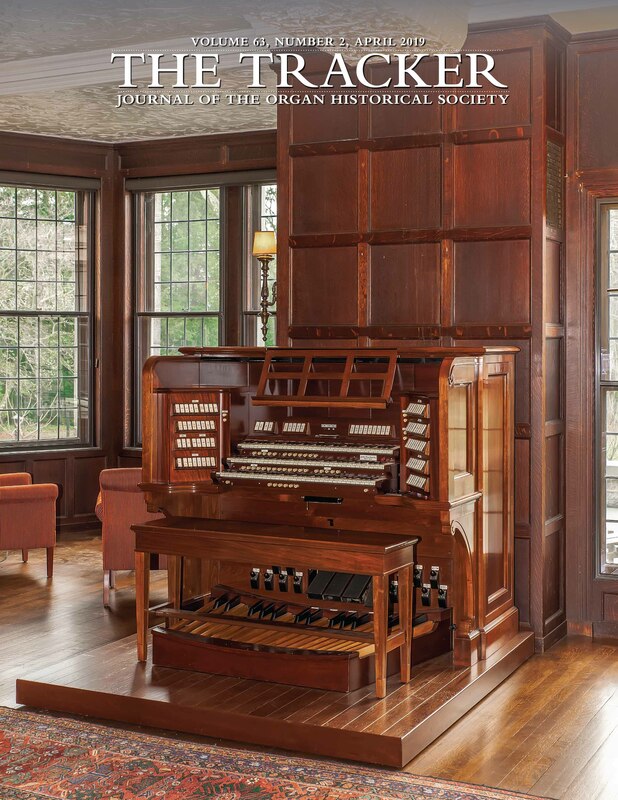 The ORGAN HISTORICAL SOCIETY is not oblig­at­ed to any com­mer­cial inter­est. The Soci­ety will pre­vent or pros­e­cute: 1) any use of its mate­r­i­al to imply endorse­ment or dis­cred­it; 2) mis­use of the name The Track­er; 3) mis­use of the name ORGAN HISTORICAL SOCIETY. The Track­er is a reg­is­tered trade­mark.